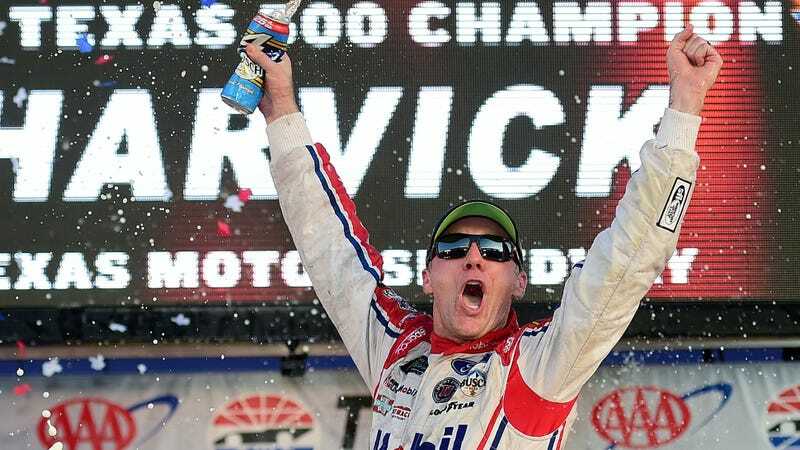 Texas Motor Speedway’s Victory Lane celebrations are always full of nods to the wild west, with cowboy hats, huge flames, big Texas stars and Texas-shaped confetti. However, one part of their usual celebrations didn’t seem right after a mass shooting near San Antonio: letting the winner fire a pair of pistols in the air. While there was still plenty of Texas kitsch to go around (I mean, just look at the trophy), Texas Motor Speedway President Eddie Gossage told USA Today that they were skipping the pistols out of respect for the 26 people killed Sunday when a shooter opened fire on the First Baptist Church congregation in Sutherland Springs, Texas. The speedway’s use of pistols has caused some controversy in the past, particularly after the Sandy Hook Elementary School mass shooting, when the National Rifle Association was still the title sponsor of races at TMS. So, it’s understandable why the track would want to err on the side of caution this time, especially since the tragedy was so close to the track.